Making your plans for Parade Day? Here's some information that might make things a little easier as you stake out your spot and join in the fun. 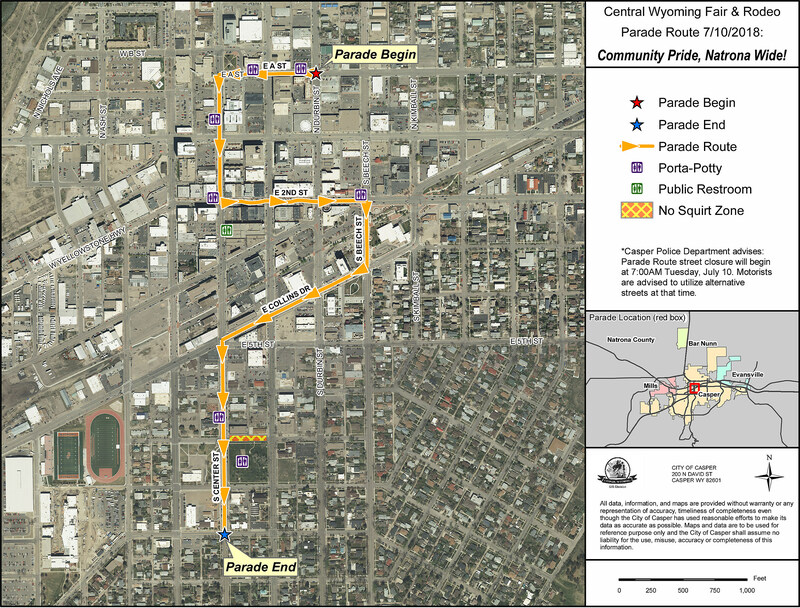 The Central Wyoming Fair and Rodeo Parade kicks off at 10:00 a.m. on Tuesday, July 10th, starting at "A" and Durbin Streets and winding its way through downtown Casper to end just past City Park on Center Street, according to CWFR organizers. The map, which you can view in a larger version below, also outlines Porta-Potties, public restrooms, and the "No Squirt Zone" if you prefer not to get watered down by the passing parade. The Casper Police Department says the Parade Route street closure will begin at 7:00 a.m. Tuesday morning, so be sure to move your vehicle off the route and find another way around the area. Temperatures for Parade Day are forecast into the upper 90's, and meteorologist Don Day says the two main factors to consider are to stay hydrated, and to protect yourself from the sun with a hat, sunscreen, or both.